Excellent solution for better sound quality! Everything that can vibrate will color the sound and that includes the surface that the monitors are mounted on. The EPP05 decouple the energy from the supporting surface which results in a significantly improved audio sound. 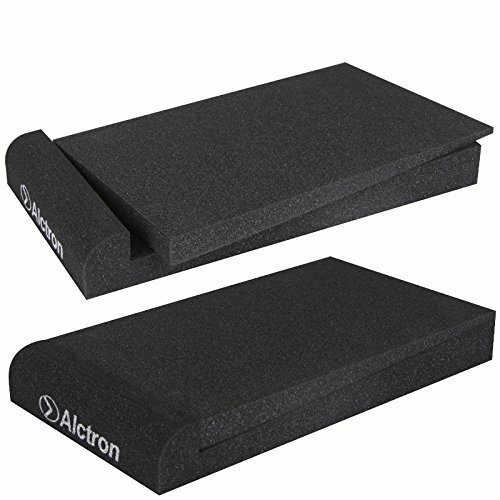 Alctron EPP05 Monitor Isolation Pads provide sonic isolation between your monitors and whatever your monitors are resting on, INSTANTLY improving the accuracy of your entire monitoring system. EPP05 are designed so that they can be used to support virtually all sizes of bookshelf loudspeakers or recording monitors up to 100 lbs. each. While some smaller loudspeakers may be sufficiently supported by a single EPP05 , most require the support of two EPP05 . Note: If you have very large monitors or they weigh more than 110 lbs. you may want to consider using Alctron EEP07 or EEP08. - decouples your speakers from bookshelfs, desktops or monitor stands. - foam wedges provide up to 3 tilt options, including flat. High density (TEST 20pound monitors is not deformed) to prevent harmonic coupling and low-end distortion. 2Sold in pairs so they can accommodate many different sizes of monitors, including monitors placed horizontally，A pair includes (4) base pieces and(4) angling wedge pieces. Base Pieces are 11.8" long x 6.7" wide x 1.6" thick with 110 pound limitation fit all popular 5" Studio Monitors: JBL LSR305, KRK Rokit 5, Yamaha HS5, M-Audio BX5 and More. If you have any questions about this product by Alctron, contact us by completing and submitting the form below. If you are looking for a specif part number, please include it with your message.